The idea is that run-and-gun teams will see their pace come to a grinding halt once the postseason starts; teams will focus on getting back on defense and will give away less in transition. How much this hurts up-tempo teams in the playoffs is hotly debated. The idea that the game slows down, though, is not. It’s just a truism. But is it even true? Based on possessions per 48 minutes, the recently completed second round of the 2018 playoffs was the third-fastest playoff round since 1997, which is as far back as the NBA Advanced Stats database reaches. Not only that, but this year’s first round was the sixth-fastest. And of the 15 fastest rounds in the past 22 years, 14 of them have come in the past four years. 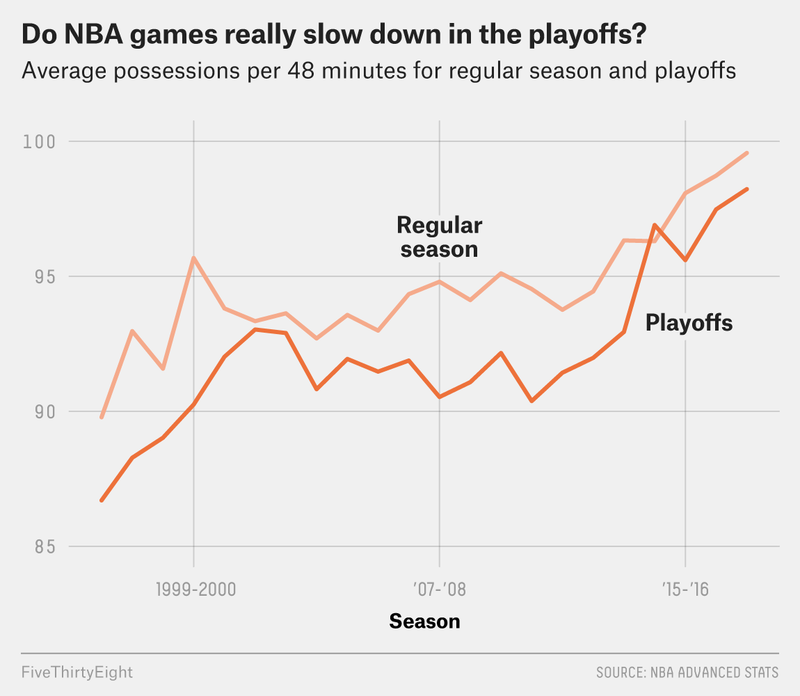 Of course, it makes a good deal of sense that playoff basketball is getting faster, because regular-season basketball is getting faster as well. The league average pace during the 2017-18 regular season was 99.57 possessions per 48 minutes. That’s nearly 10 full possessions faster than the 1996-97 campaign, which was played at an 89.78-possession pace. The rate of change is also quickly rising: This year’s regular season was more than five possessions per game faster than the league was even five years ago.1 With the game getting faster each season, it’s worth examining just how big the drop-off between regular-season and postseason basketball really is — if it exists at all. Since 1996, the regular season has indeed been played at a faster pace than the postseason in all but one year. But based on how the playoffs are thought of as a slog, you would expect the rate of slowdown to be massive. That has not actually been the case. On average, playoff games over the past 22 years have been played 2.42 possessions per game slower than regular-season games — roughly 2.6 percent slower than regular-season games in that span. But even the rate of the postseason slowdown has been dropping off of late. In 1997, the playoffs were 3.4 percent slower than the 1996-97 regular season. By 2000, the drop in pace reached 5.7 percent. In other words, the truism, back then, actually was true. Since the turn of the century, however, it has become increasingly less true. And in 2015, the playoffs were faster than the regular season for the first time in at least 20 years. But the expected difference in pace between the conference finals highlights one other NBA perception that has largely held true over the years: Western Conference games are a bit faster than those in the Eastern Conference, and Eastern Conference basketball slows down in the playoffs more than Western Conference basketball does. Thanks to the NBA Advanced Stats database, we are able to isolate games played between Eastern Conference teams and those played between Western Conference teams for every regular season since 1996-97. The West has been the faster conference in 18 of the 22 seasons. The gap between the conferences has at times been portrayed as wide, and for a good while (from 2006-07 to 2014-15), this was true. 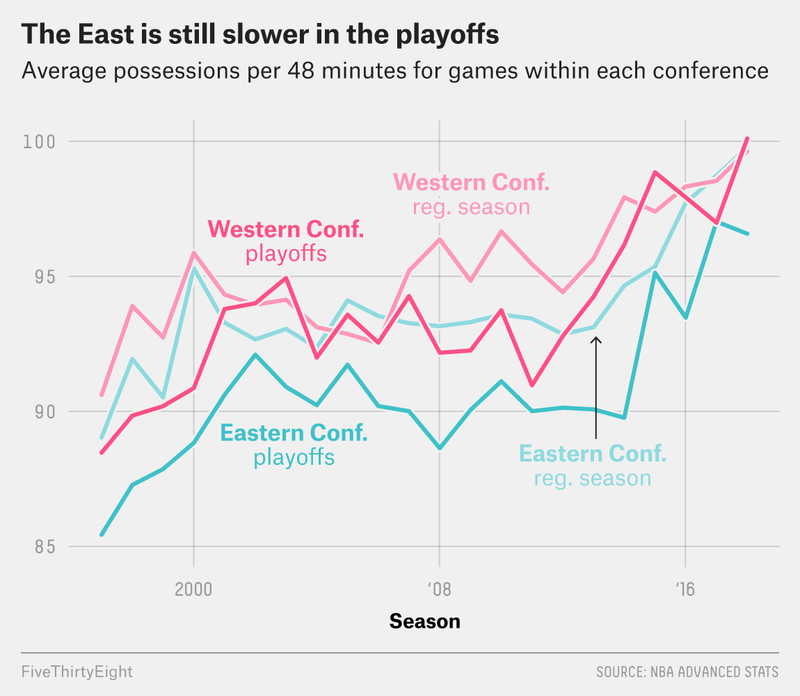 But the East has rapidly caught up over the past few years, and it has actually been the faster conference each of the past two regular seasons. The playoffs are another story. While regular-season games played between West teams since 1997 have been 1.36 possessions faster than those contested between teams from the East, the average West playoff game since 1997 has been 2.88 possessions faster than the average East playoff contest. Even the conferences’ drop-offs from their regular-season pace has been starker in the East than in the West. On average, Eastern Conference playoff games have been 3.06 possessions slower than those played during the regular season. In the West, the differential has been just 1.54 possessions. Much of this can be pinned on one man: LeBron James. James’s teams — a constant presence in the East playoffs for more than a decade — not only play slower than most believe, they also like to slow the pace even more during the playoffs, in an effort to allow James to control every inch of the floor. His teams, either the Cavaliers or the Miami Heat, have played slower in the Eastern Conference portion of the playoffs than in the regular season in 12 of the 13 years he has made the playoffs, including this year. On average, they’ve played 3.40 possessions slower, and this year they’re 6.70 possessions slower. Interestingly, James’s opponents have been able to speed his team up in all but one of his NBA Finals appearances.2 If the Cavaliers beat the Celtics and get to the finals again, the smart bet would be on the Warriors or Rockets being able to speed up the Cavaliers this year as well. If that happens, and if the conference finals are played at as fast of a pace as I think they’ll be, it’s possible that this year’s playoff pace will surpass that of the regular season. And if that happens for the second time in four years, we have to start rethinking the idea that getting to the playoffs slows down the game at all. The 2012-13 season was played at a 94.44-possession pace. The exception was 2007, James’s first trip to the championship round, when his Cavaliers were swept by the San Antonio Spurs.